Kay, I love a good burger, like LOVE a good burger, and I love greek food, and cheese, and burgers… oh wait, I think I said that already. 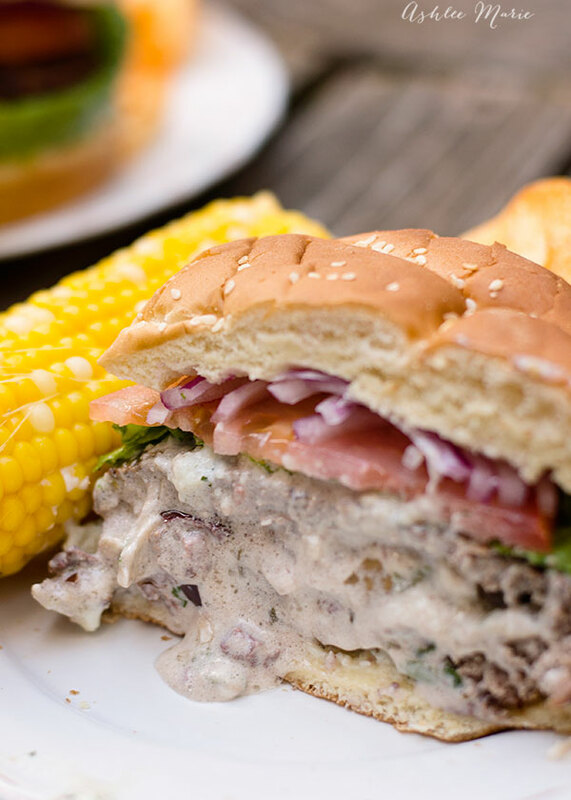 ANYWAY, when we decided to get away for the weekend with my sister and her family we decided to make hot dogs for the kiddo’s and decided to create Stuffed Greek Burgers for ourselves – they turned out BETTER than I expected, seriously SO good! 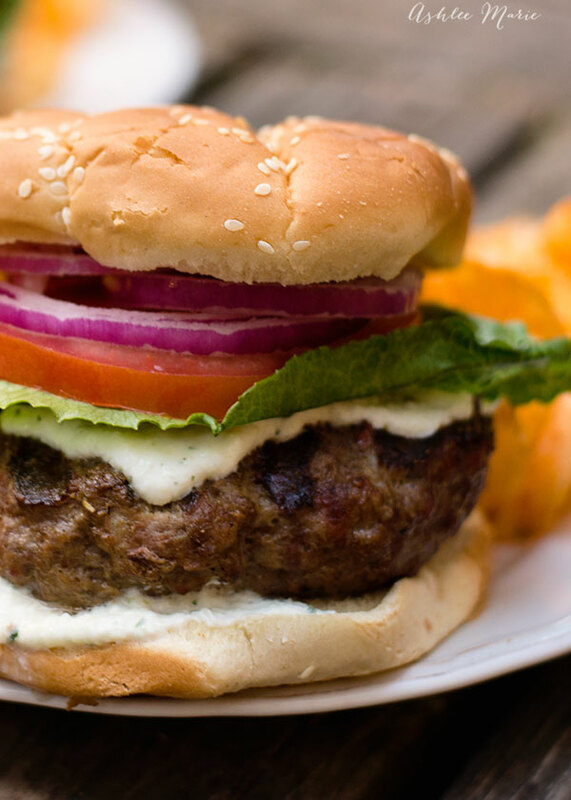 Three meats create a perfectly moist burger that comes together wonderfully. I added the same spices I use to make gyros for a great greek base. Then comes the fun, the FILLING!!! what to go with… Kalamata olives and feta were obvious choices. I added grilled onions, spinach and goats cheese as well, SOOOO good! Then top with my Tzatziki sauce, thinly sliced red onion, tomato and some kind of lettuce (I like romaine or spinach). Spread the filling about 1/4 inch thick onto the center of the large patties, leaving 1/2 inch edge. Place the smaller patties on top and bring up the sides of the larger patty, pinching it closed. My Brother in law made his burger with the lettuce on the bottom bun, so the tatziki sauce wouldn’t make the bun soggy, I have to admit it was a good trick! Next time I’ll get a picture without the tzatziki sauce on the burger, cause it just merged with the filling as it oozed out and it’s hard to see, but MAN was it tasty! I can’t wait to make them again! 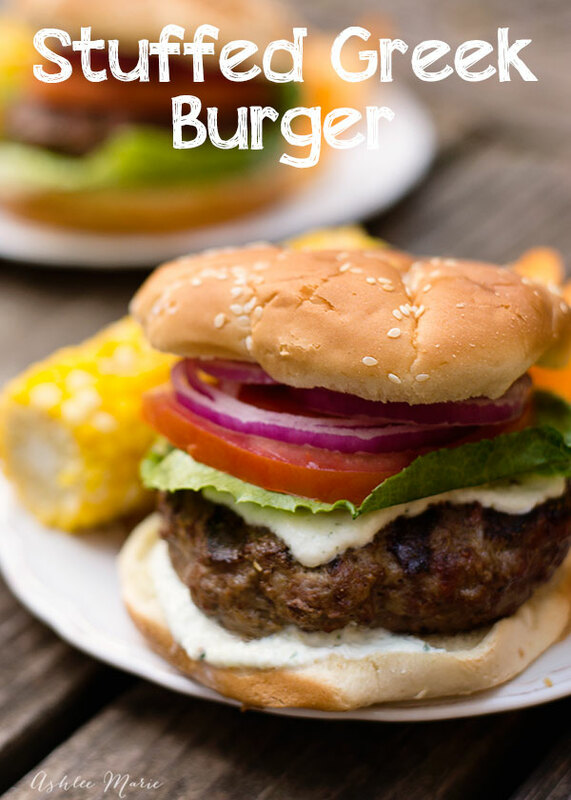 What is YOUR favorite burger flavor/style? I need more! Ohhhh this looks fabulous! 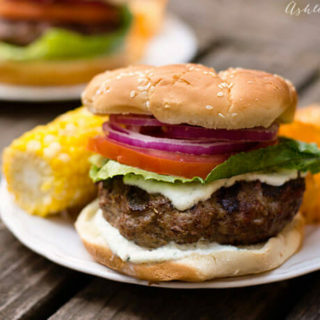 Love trying out different flavors with my burgers! me too, It’s a messy burger for sure, but that just makes it taste even better, right? Looks delicious. This calls for 3 lbs of meat but you state it makes four hamburgers. That can’t be accurate. your right, the 3 lbs made FIVE hamburgers, not 4! thx!